The early spring flowering trees are the first hint of the upcoming season, thanks to their vivid colors and lovely fragrance. 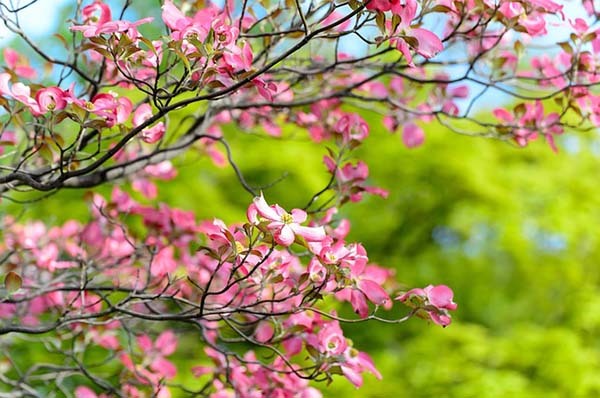 Whether you prefer tall or smaller spring trees, each one has the ability to beautifully veil your garden or yard. What are the first trees to bloom in spring? Wild plum, Eastern redbud and Dogwood flower to name a few. They will surpirse you with early blooming in the spring. And what’s best is that you can use some full blossom branches to create a stunning spring centerpiece ideas. 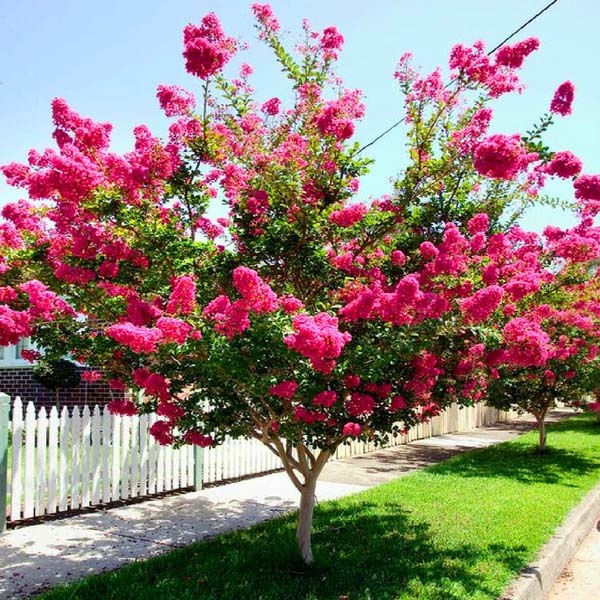 Crape myrtle, or Lagerstroemia, is a tree that blooms in spring and is really one of the most appealing pink trees that bloom in spring! You will fall in love with that tree when you see it in full bloom. Or, perhaps, maybe you could plant a couple of them in your yard and share with the rest of the souls in this area their astonishing beauty! One more idea – you can get some blossoms and create a stunning spring centerpiece. 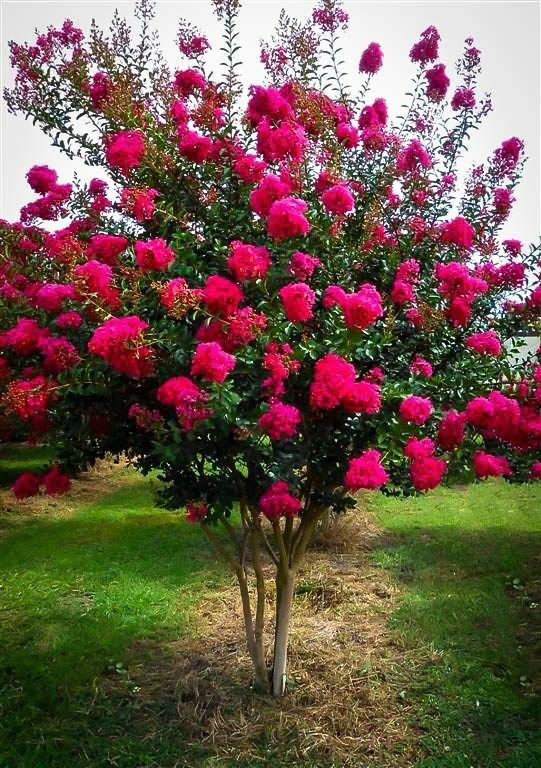 Crepe myrtles are mainly appreciated for their vivid and long-lasting flowers which happen during the summer season. Their leaves usually range from 2–8 inches, while their height can go from over 30 m (100 ft) to under 30 cm (1 ft). The fruit is a capsule, green and fleshy at first, then maturing to dark brown or black dryness. It divides along six or seven lines, producing teeth much like those of the calyx, and releases many petite, feathered seeds. Oh, who in this world wouldn’t love a Lilac tree? This tree is about spirit, intellect, mystery and feeling like a royal. Possibly some of the best purple trees blooming in spring are exactly lilacs. To my perception, their colors and scent are incredible imprints of the arriving spring. 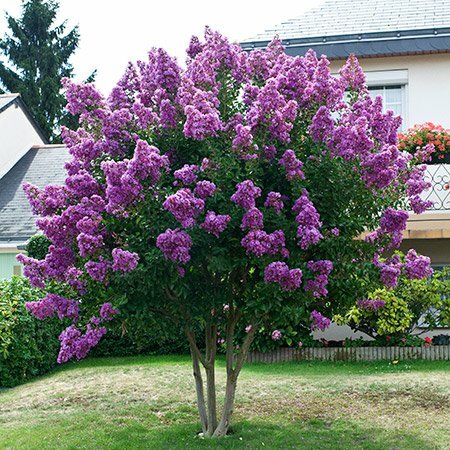 There is a couple of different lilac spring trees that offer the scent and excellence of the lilac bush species, with the addition of height and shade. 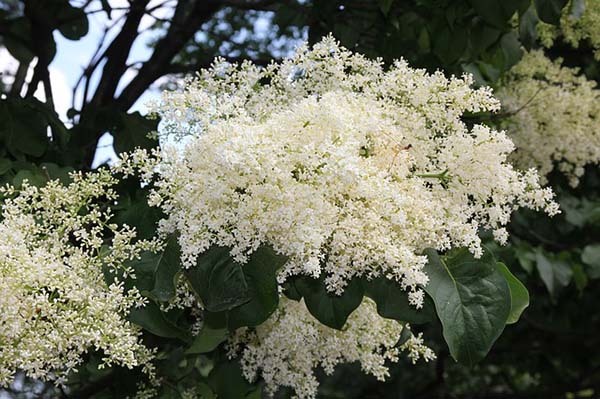 These are the 25-feet high Japanese tree lilac that produces perfumed creamy white flowers and the smaller “Ivory silk” (20 feet high) that usually blows in the early summer. This cute little fellow is full of colors and is an awesome tree that flowers in the spring. 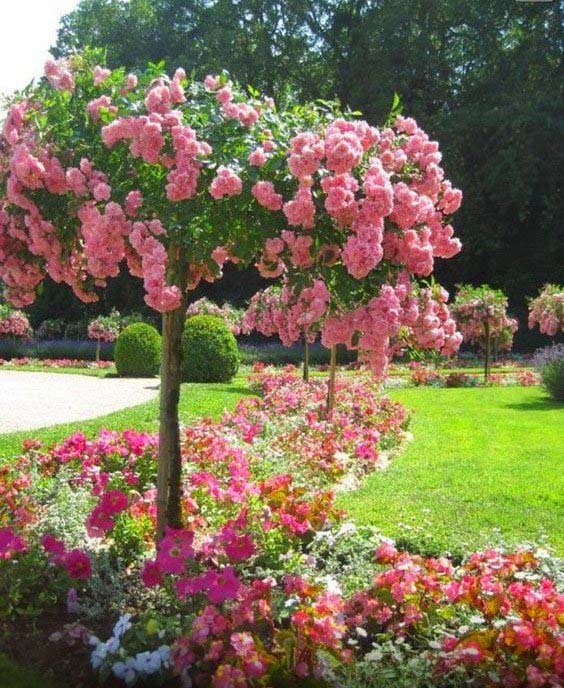 The crown of the tree is so abundant and full of blossoming beauties that it’s quite right that it carries the name French Rose. These rosy petals will gently absorb the sunshine and grace everyone with their fantastic looks! The French rose, also known as Rosa gallica, is a vivid shrub of short duration. Its flowers are quite large, fragrant and deep pink, assembled one to four together, on glandular pedicels. Each flower has five or more petals. The sides are either orange or brown, cylindrical, with 10–13 mm in diameter. In Japan, there are plenty of blooming trees in spring that bring glamour to the country. This Ivory Silk has an exquisite fragrance and no perfume can stand up to it. The story of Ivory Silk is white, creamy and delicious! It presents a petite tree or large shrub that forms a rounded crown with rich green foliage on pleasant dark brown bark. Its crown is surely a jewel and its look is so gentle and nice! The appealing creamy-white blooms of the deciduous Ivory Silk enchants with its alluring fragrance spring through summer. Many try to measure success, but what really makes us feel successful is feeling surrounded and enticed by the miracles of living. This tree reminds us of the inner beauty, the kindness and the ornaments of life. So many details, so much fragrance! 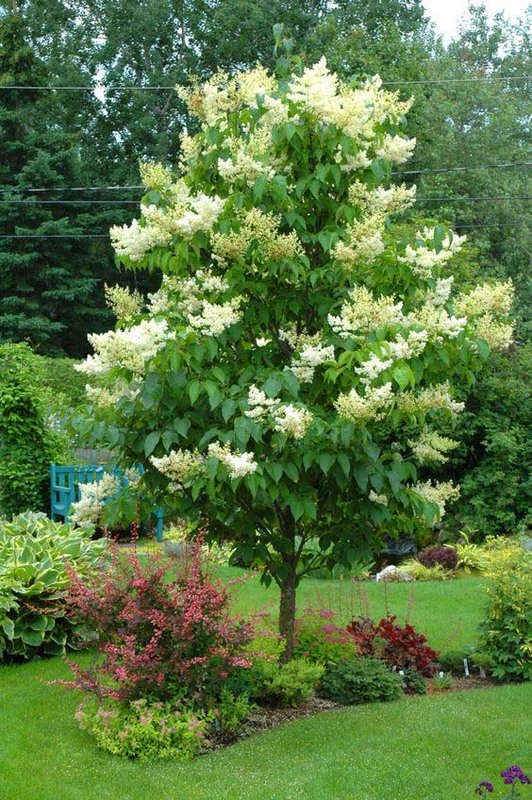 The Japanese lilacs, or Syringa reticulata, are either very large shrubs or trees with white flowers in spring that spread to a height of up to 30 feet with a spread of 15 to 20 feet. These spring trees are native to eastern Asia and their Latin name “syringa” means pipe and refers to the plant’s empty stems. Their fabulous name doesn’t do them any justice. Just take a look at this color and let it sink deeply into your eyes. There is so much passion, freedom and creativity happening here. We need more of these pink trees that bloom in spring around. Threes are irreplaceable sources of inspiration and liveliness! These are the Twilight series of trees. The lowest maintenance, the most intensive dark purple color and the promise of happiness! It’s all about energetic balance with this tree. High vibrations, purity, and impact – add these to your day and magic happens! Light fragrance and an uplifting look! 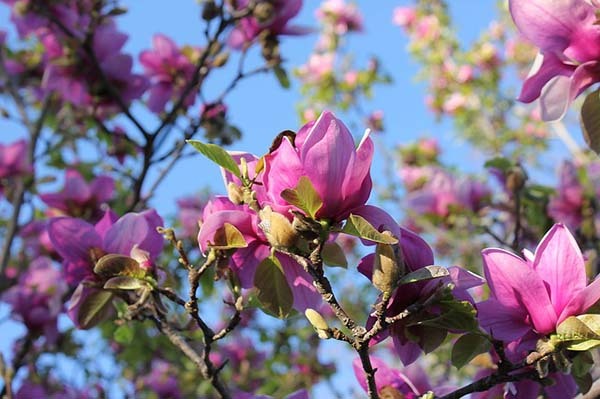 Saucer magnolia is one of the most cherished spring flowering trees thanks to its large showy blossoms that usually grow up to 8 inches. Also known as Magnolia x Soulangeana, it is a hybrid large shrub or small (20-25 feet hight) tree in the genus Magnolia and family Magnoliaceae. Tip: In regions with staying late spring frosts, don’t plant near the southern side of a structure because retained heat might cause early blooming, which frost can quickly get rid of. In early spring, the Hyperion dogwood is a fairly new, 20-feet tall ornamental tree that happens to be covered in oversized, showy white or pink blossoms. Later in the spring, the flowers disappear to form reddish, strawberry-like fruits that the spring birds adore. They create a perfect contrast with the leafy, spring surrounding. 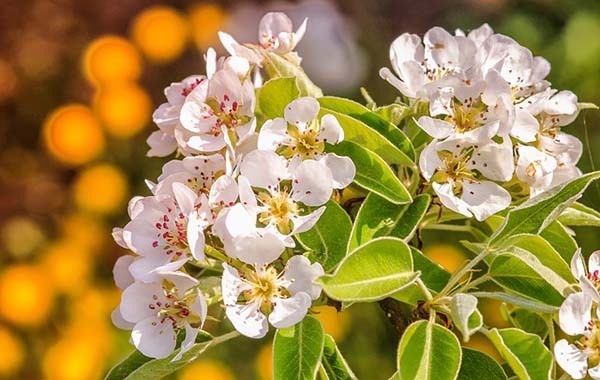 If you are a fan of the white blooming trees in spring, the flowering crabapple tree is what your backyard needs then. 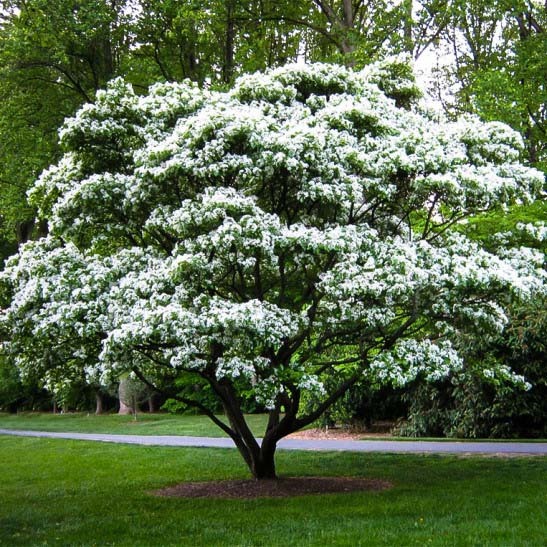 It is a compact (from 15 to 20 feet height), ornamental tree that brags with dazzling, fragrant snowy white blossoms. Moreover, it loses its foliage seasonally. The flowering crabapple tree prefers moisturized, well-drained soil and full sun (at least 6 hours direct sunlight daily). It’s one of the most beautiful white flowering trees in spring and you can see it all around you. Did you know that the Cherry blossom tree is the national flower of Japan? Even if you didn’t, you would all agree with me that it is one if the most alluring and wonderful spring trees! 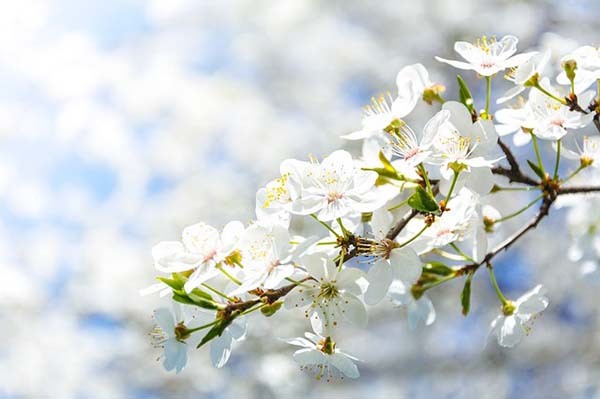 The cherry trees bloom early in spring and prefer to be planted in sheltered areas with full sun, in deep, fertile, well-drained and moist soil. In its honour, the Cherry Blossom Festival is being organized every year, in the beginning of March. As I love the white flowering trees in early spring, I wouldn’t skip the common pear (Pyrus communis). To start, Pear trees are very tall, growing up to 40 feet in height and up to 20 feet wide. Pears require full sun and, not very common, tolerate heavy clay, combined with plenty of compost. These trees usually bear fruit in 3 to 5 years after planting. 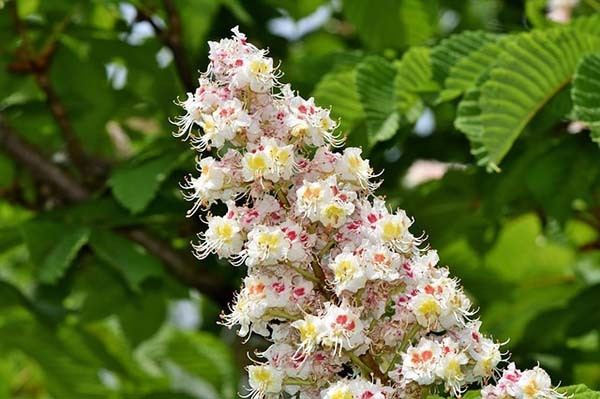 Speaking of eye-catching spring trees in bloom, we cannot ignore the Red horse chestnut, a hybrid tree between Aesculus and Carnea. Its large, showy white-reddish flowers cannot be left unspotted. This tree grows up to 35 feet tall by 25 feet wide and is a common sight in parks, gardens, and village greens. 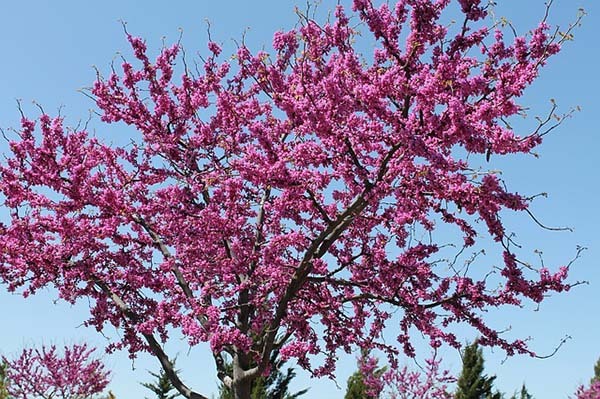 The lively Oklahoma Redbud is one of the spring trees that is appreciated for its lavishness of vibrant, delicate, purple-reddish blossoms that cloak the bare branches to link the gap between winter and early spring! The lustrous foliage always draws attention to the tree even by those who don’t pay attention about landscaping. 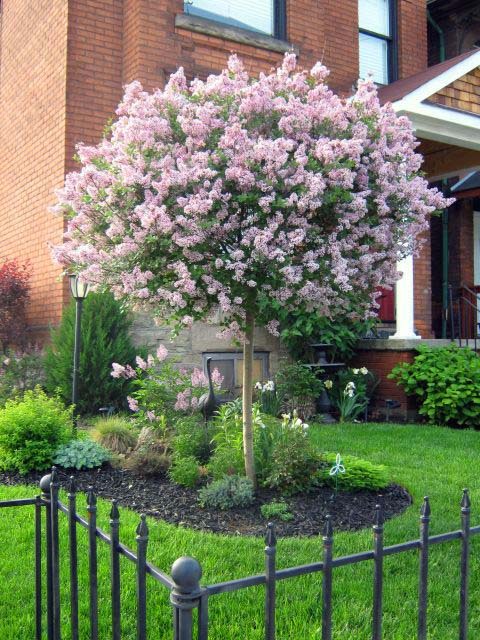 Oklahoma Redbud is ideal for small yards because it usually reaches about 15 feet in height. I decided to finish this collection with a specie that those of you, who prefer the white flowering trees in spring, would love. Often called a “dogwood alternative” by landscape architects, the appealing native American fringe tree (Chionanthus virginicus) blooms in late spring. The small snowy white blossoms create a fringe on the tree, that’s why many gardeners call it “fringetree”. Red fruits will invite some singing birds. What an idyll, eh? Ideal for spring, blossoming trees boast colorful buds that will soon bloom into lively and showy spring flowers. Moreover, the colorful spring trees serve as a reminder that spring is approaching fast, and we will have joyful yards again before we know it. 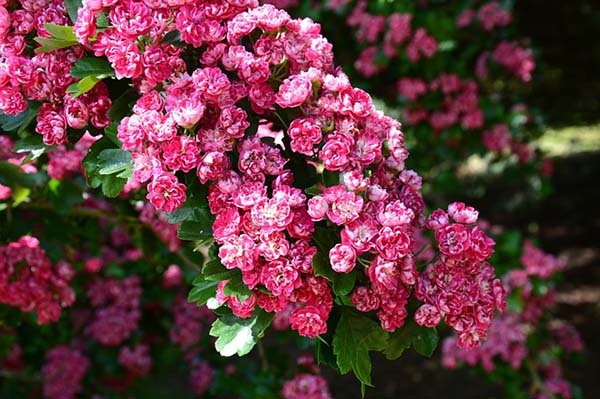 Hopefully, you liked our list of 15 spring blooming trees!Which one would you grow in your garden?